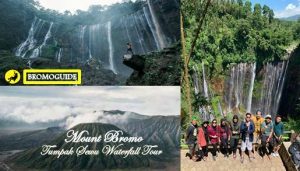 Mount Bromo Tumpak Sewu Waterfall Tour 3 Days | Mount Bromo and Tumpak Sewu Waterfall is one of the natural beauty located in East Java, Coban Sewu (Tumpak Sewu) is a waterfall with a height of approximately 120 meters with the beauty of a unique spring formation because it has a wide air flow. the location of this waterfall is in Lumajang area which borders Malang. The tourism of Mount Bromo is a mountain that is in the position of the three most beautiful mountains in the world, being one of the most beautiful sunrise points in Indonesia which is a target for both local and foreign tourists. with the hospitality of the Tengger tribe people who still adhere to the customs of the ancestors and are still awake to this day. Our team “Bromo Guide” will pick you up at Airport / Station or Hotel and Continue to Cemoro Lawang with duration of 3.5 hours driving. Arrive at hotel, chek in and rest. Bromo Jeep Driver will Pick you up from hotel and continue towards Penanjakan 1 To see sunrise. After enjoy sunrise, continue towards Bromo Crater, You can do Soft Trekking to get the crater,or rent a horse. Then continue to prairie Savanna or Teletubbies Hill and Whispering Sand. Afterwards, back to hotel for breakfast and packing up to continue th tour to hotel in Lumajang city. Then check in hotel and free program. Drive from Lumajang towards Tumpak Sewu in Sidomuyo village. Arrive at Tumpak Sewu parking area, walk down to waterfall point crossing river for 30 minutes. After You finish enjoying waterfall, return to Surabaya / Malang. Whe you reach Surabaya / Malang, the Mount Bromo Tumpak Sewu Waterfall Tour 3 Days ends. If you have more spare time in East Java, you could take other tour packages. Here we provide more optional tour package which may suit you, such as Bromo tour package, Semeru trekking tour, ijen tour package, and other kinds of Bromo tour. You can visit our contact to get more information about Tour Package and the price.